We stock many different dump and equipment trailers on site at all times. We have everything you will need to haul equipment or to handle those heavy loads. Call us today at (905) 773-4260. Dump Trailers: We supply heavy duty hydraulic dump trailers. All Tube Steel Frame and Diamond Plate Fenders have a Black Pearl Powder Coated Finish for good looks and rugged durability. 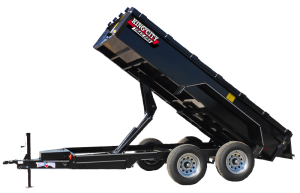 These dump trailers are hydraulic dumps powered by a self-contained 12v electric power pack with remote activation. The tailgate features an automatic latch for safety and easy dumping. Tailgates are available in regular or barn door style. With long haul dump trailers you can haul more and handle less. 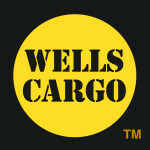 Equipment Trailers: Our equipment trailers are built and designed to stand up to the needs of professionals. They’re sturdy enough to haul skid-steers and backhoes and with enough options to allow you to customize to your specific needs. Our equipment trailers are available with steel or wood decks, regular, low profile or deck over options so you can get the exact trailer you need. 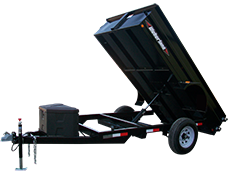 Our dump trailers are hydraulic dumps powered by a self-contained 12v electric power pack with remote activation. The tailgate features an automatic latch for safety and easy dumping. Tailgates are available in regular or barn door style. With Long Haul Dump Trailers you can haul more and handle less. Our float trailers are built and designed to stand up to the needs of professionals. They’re sturdy enough to haul skid-steers and backhoes and with enough options to allow you to customize to your specific needs. Trailers are available with steel or wood decks, regular, low profile or deck over options so you can get the exact trailer you need. 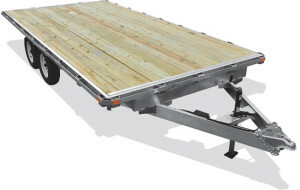 Our Deckover trailers are built and designed to stand up to the needs of professionals. They’re sturdy enough to haul skid-steers and backhoes and with enough options to allow you to customize to your specific needs. 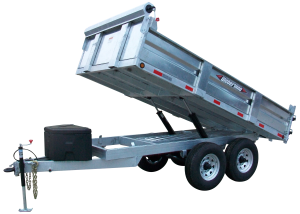 Trailers are available with steel or wood decks, regular, low profile or deck over options so you can get the exact trailer you need. The EZE-Lift hydraulic float trailer. The EZE-Lift solves the problem of loading and transporting equipment like scissor lifts and forklifts that don’t handle ramps. The bed of the EZE-Lift is hydraulically lowered parallel to the ground, equipment can now easily be driven up and transported. Risk of injury or equipment damage from tipping or getting stuck on the ramp is virtually eliminated. Developed specifically for industrial and commercial applications, long lasting durability is engineered from the ground up. The real difference is in the details; reinforcing gussets at all major stress points, weather protected brake wiring, and door hinges with grease zerks. You won’t find a longer lasting trailer or one that requires less maintenance . . . period! Now you can offer haul-away bin service, material and equipment delivery. Anytime a trailer sits, it isn’t making money. 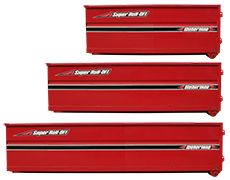 The Super Roll-Off lets one truck and chassis service many bins and flat-decks. Now you can offer haul-away bin service, material and equipment delivery all without the need to modify your truck.